I woke up today in a creative mood, so I threw together some homemade McMuffins. The result was awesome, so I’m posting my process in lieu of sharing my actual food. Which was awesome. The bread (Thomas Original, on sale last week) went in the toaster oven for 8 minutes whole. All week I’ve been opening the muffins before toasting and have been unhappy with the results. This worked much better, with a firm crusty exterior and a soft, fluffy interior replete with nooks and crannies. Sorry, but it’s actually illegal to discuss English muffins without using the phrase “nooks and crannies” somewhere. The N&Cs needed something to contain, so I cracked a jumbo egg into each of two Pyrex 10 oz custard cups. These happen to be the ideal size for preparing eggs for an English muffin; I use cereal bowls if I’m making bagel sandwiches. The eggs got salted (table, not kosher) and peppered (mixed blend, fresh ground) and went into the microwave, which I think is underrated as a means of egg cookery. With vigilance some excellent results can come from a little radar love. The eggs got nuked on ‘high’ for 20 seconds at a time, pausing each interval to sweep a fork around their edges. This serves two purposes: first, it keeps the eggs from sticking too badly to the dishes, and second, it releases any stored-up heat from underneath the egg which will, if left alone to build up, escape violently later and blow egg all over the microwave. Several of these intervals are required, but patience will be rewarded. When the eggs were nearly done, I sliced up half of a small Virginia smoked sausage that I grilled last week and keep in the fridge for just such an emergency. These slices were Domino’s-pepperoni-thin, to promote very fast cooking, actually just reheating (within one 20-sec burst in the microwave). The English muffins went ding, so out they came. I pierced all around the edges with a fork in order to perforate the muffins before pulling them open. This is essential. I’ve had muffins that were thick enough to pull open without piercing first, but these relatively flat little guys would have been destroyed by such rough handling. Slicing open an English muffin with a knife ruins it; the trademark internal texture is wasted and that convoluted surface area is reduced to a noninteractive sheer surface, happy to let sauces and toppings slide right back onto the plate. The eggs, now a light over medium (yolks soft and slightly runny, whites solid but light and very fluffy) went onto the open muffins, topped as shown with a ring of sausage slices, and a small slice of butter went right on top of the yolk to melt and be received by the upper muffin once assembled. Cheese is normally an unskippable step here, but all I had was Provolone and I was concerned that a big slice of cold cheese would ruin my temperature balance, as well form a smokefest when combined with the already smoky sausage, potentially masking all other flavors. If you have something more balanced available, I recommend using it, perhaps melting over the muffins before assembly. The proof, of course, came in the eating, and I did miss the cheese a little for structural reasons – my sausage bits wanted to slip away once the butter melted around them, and I would have appreciated a binding agent. But the flavors were excellent, and I’m very pleased with the result. I have eggs on the brain this week, so stay tuned. If my egg/sweet potato combination theory works out, I’ll let you know. I survive on eggs and comments, so leave one or the other below if you don’t mind. 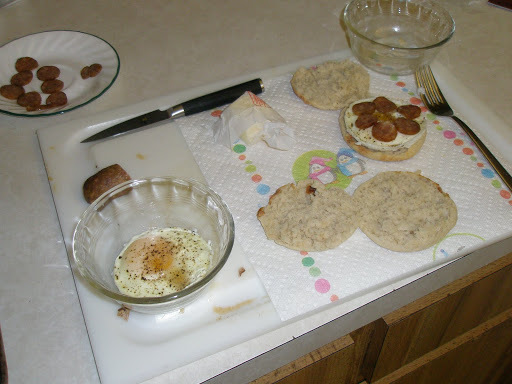 This entry was posted in egg, english muffin, microwave, recipe, sausage, smokefest. Bookmark the permalink. i have a magazine-torn recipe for pached eggs with sweet potato hash, so i think the combination has some potential! (Tomorrow the growing one gets a ceramic or plastic home, btw). Hooray (cookies) for the sweet potato! I get all my pots from a pile next to our dumpster. If you want to expand your garden, I strongly recommend living near someone who throws away a lot of gardening supplies.